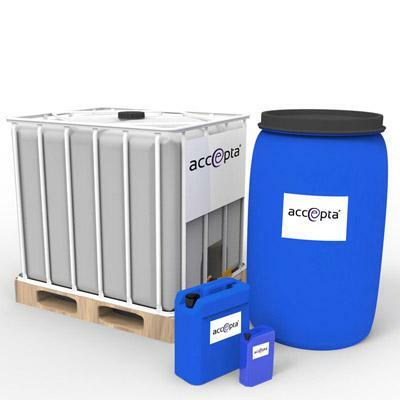 Available in 25kg or 200kg drums and 1000l IBCs. Accepta 2334 is a high performance, supplementary corrosion inhibitor developed for use in open or closed water systems. In particular it creates an insoluble polymeric surface complex on copper and its alloys and also reacts with copper in solution to inhibit corrosion. Additionally, Accepta 2334 works synergistically with other corrosion inhibitors to effectively control the corrosion of steel and aluminium used in open or closed systems. High performance supplementary corrosion inhibitor for open and closed water systems. Protects copper and its alloys by building an insoluble polymeric surface complex. Acts synergistically with other inhibitors to effectively control the corrosion of steel and aluminium. The dosage of Accepra 2334 varies widely with different applications and will be advised by Accepta’s technical support team. For further information or support please contact us.